to help to foresee upcoming challenges or victories. that will hopefully make your ride a little bit easier. 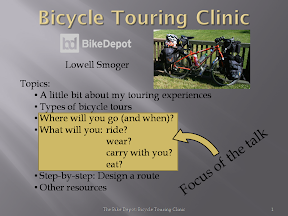 Check out the slides from the bicycle touring clinic that I ran in 2014! 1) Google Maps bicycle routing is still BETA: Google Maps bicycle routing may be able to you around your hometown no problem. While in Seattle, I met the man who spearheaded the project of getting those beautiful green lines on the map. I learned that Google balances elevation, distance and safety of the roads (and perhaps some other variables) in an algorithm to give people an optimal route. After extended use of the routing tool, you may notice that this algorithm doesn’t exactly have a “simplicity” or “common-sense” variable. A similar thing happened in Minnesota and Washington where Google Maps had drawn a long green line halfway across the states, implying there was a bicycle friendly trail on which to travel. The John Wayne Pioneer Trail (left) is in fact bicycle unfriendly between Bristol & Royal City. In both cases, the “path” either prematurely turned into grass or large stones used under train rails. I learned this lesson by the time I reached the Washington path and had already prepared a backup route in case the path was unsuitable to ride, which it was. My advice is to take these green paths with a grain of salt. Use the Street View option whenever possible and local knowledge to help plan your route. 3) Road Signs & Creek Crossings: In the western states, I have found that every time one lane turned into two, I ended up climbing a hill. Similarly, just before the top of the hill, the two lanes would turn back into one. Knowing this was particularly helpful for motivating me just before or near the top of a hill, especially on curved roads where I couldn’t see very far ahead. Similarly, when a road crosses over a creek prepare to begin climbing; water always flows to the lowest point and between two adjacent hills. 4) Riverside Riding: Early on, Hannah and I cycled alongside Kanawha River in West Virginia. In Idaho, I traveled alone along the Little Salmon River. In both cases, I was able to traverse great distances without significant climbing. Sure, the road broke away from the river sometimes and presented a small climb, but these detours were few and far between. My advice, if you want some easy riding and multiple opportunities to cool off in the water, ride along a river and you won’t be disappointed. 5) Tent Techniques: There are going to be times when you simply can’t use stakes to secure your tent or fly. Maybe you’re on a beach or, like in the picture, on a bridge in Winner, SD. Either way, stakes won’t work because the ground is either too hard or too soft. In these cases you have to be clever and use anything you can to secure your tent from rain, wind or other elements. You’ll see in the picture that I used bungee cords to keep tension on all corners of the tent. The bungee cords were connected to a variety of things ranging from a gallon jug of water, my bike, Brian’s tent (teamwork! ), and the rails of the bridge. Just remember to unhook the cords before you try to ride away! 6) Map Reading 101 Interpreting maps can be very helpful and while technology has allowed me to travel well without this skill, it’s still fun and helpful when technology isn’t. Here you’ll see a picture of the old highway up White Bird hill. The new highway is also shown running just above the old. Even if you don’t have a terrain map, it should be obvious that Idaho is not going to build a road with switchbacks just for fun. When the old highway was built, it was the only means of ascending the mountain. More recently they were able to build a straight road with a slightly steeper grade but I kept to the old highway because I practically had the road to myself for the 3 hours it took me to travel 10 miles and 3300 feet! But I leave you with this thought on climbing…you either have to be efficient or not give a crap. 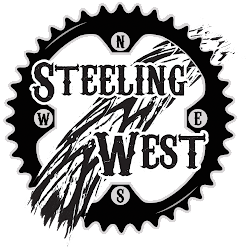 7) Pacific Coast Riding There’s a reason I met so many people on the ride from Seattle to Los Angeles. This picture should serve to explain why. The amazing landscape of the coast, the picture perfect state parks and wonderful towns were transformed every day for a about an hour when everything turned to gold. As the temperature dropped to perfect, fewer automobiles traveled the highway and it felt as if I could pedal forever in this light. Sunset on the coast is quite possibly the best time to be on your bike so don’t worry if you’re on your second cup of coffee at 11am. The best is yet to come.